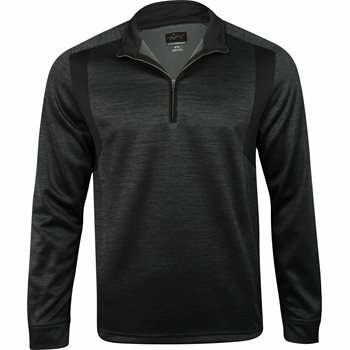 The Greg Norman 1/4-Zip Heathered Fleece Mock Neck pullover is an excellent addition to your wardrobe. The fleece material keeps you warm on cool days, UV protection keeps you safe on sunny days, and water protection keeps you dry on rainy days. An additional benefit of the pullover is moisture wicking, the process of drawing sweat away from the skin so that it evaporates through the fabric. This process ensures cool dry skin throughout the day. Design details include a reflective Shark logo centered on the back collar, solid accent panels on the sides, a mock neck for additional warmth, and a ¼ zip placket for closure adjustability.